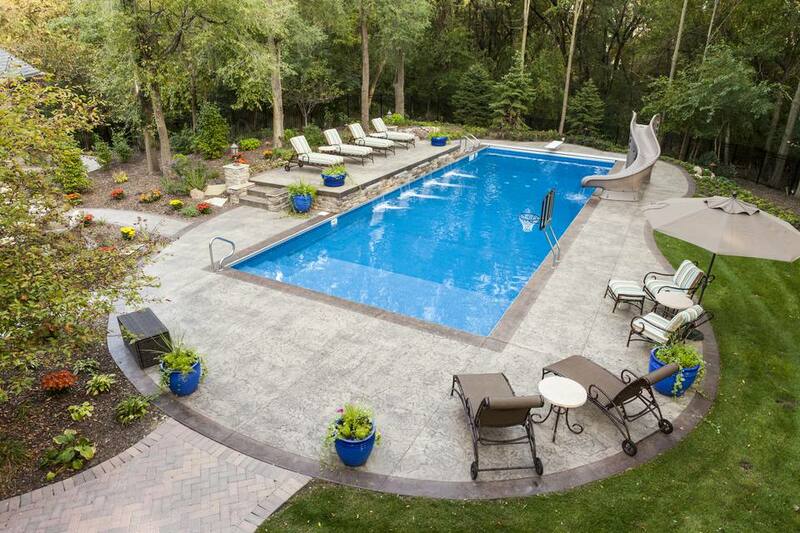 If an inground swimming pool is constructed of concrete, it will need coping, which is a cap for the edge of the pool. Besides simply being necessary, the coping provides an opportunity for a decorative accent, which can greatly enhance the appearance of the pool. When someone inside the pool hangs on to the top edge, that's the coping they're grabbing on to the coping. Coping can be precast in straight lengths, corners or curved sections. Stones are traditionally made of grayish-white concrete with a porous finish. In lieu of coping stones, some pool designs feature concrete or wood decking that extends to or slightly over the edge of the pool. Materials include flagstone, brick or synthetic decking. In addition to serving as a decorative edge that conceals the pool's concrete edge, coping provides a nonskid surface upon which swimmers can walk. Coping for a concrete swimming pool can be made of tile, natural stone, and precast concrete. Companies that make pavers and products for pool decks also have different types of pool edging materials and copings -- like bullnose styles -- to achieve a seamless look between the pool and deck. Top-Mount Coping: The most common type of coping for vinyl in-grounds, it is also known as C-channel or half-round coping. Made of heavy aluminum with a powder-coated all-weather finish, top-mount serves as the form to pour the pool deck up against. After it has been attached to the pool wall, it's ready. Cantilever-Edge Coping: Foam forms are secured on top of the wall, then a concrete deck is poured up to the form to create a deck that comes right up and over the pool's edge. The concrete can be decorated with stamping or staining. Flat-Mount Coping: Not actually coping, but a track to contain the pool liner, on top of which is mounted a more traditional coping stone. If, for whatever reason, you don't like the idea or look of coping, the pool's concrete or wood decking can be enlarged to extend slightly over the edge of the pool all the way around its perimeter. This creates a smooth, seamless look, which is seen in the yards of modern and custom homes.